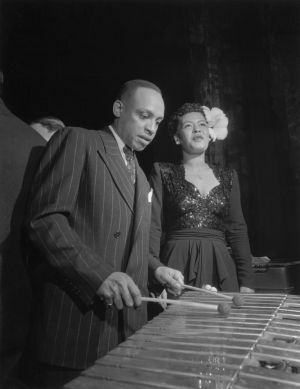 Lionel Leo Hampton, bandleader, jazz percussionist and vibraphonist, was born in Louisville, Kentucky in 1908. Hampton and his mother Gertrude moved to Chicago after the death of his father, Charles Hampton, a promising pianist and singer, in World War I. At the age of 15 Hampton began his career as a drummer in the Les Hite Band. The band relocated to Los Angeles in the late 1920s and became a regular attraction at the city’s Cotton Club. During a 193o recording session at NBC studios in Los Angeles Louis Armstrong and Hampton teamed to record jazz albums featuring Hampton on the vibraphone which would become his signature instrument. By the mid-1930s the “King of Vibes” joined the Benny Goodman Orchestra which was one of the first racially integrated jazz acts. By the 1940s Hampton left Goodman to form the Lionel Hampton Orchestra. Over the years Hampton’s Orchestra attracted a wide array of rising jazz stars including Dexter Gordon, Charlie Mingus, West Montgomery, Quincy Jones, Dinah Washington, Betty Carter, Joe Williams and Earl Bostic among others. Hampton’s Orchestra during the 1940s and early 1950s ranked with the Duke Ellington and Count Basie Orchestras as one of the leading bands of the era. It attracted a new international audience when the Orchestra began touring Europe, Africa, Asia and the Middle East. Moreover Hampton, the composer, wrote over 200 works including such jazz standards as Flying Home and Midnight Sun. He also composed a major symphonic work, King David Suite. Even after the Big Band era waned Hampton remained popular. Beginning in the 1980s his regular concerts at the University of Idaho were renamed the Lionel Hampton Festival of Jazz. In 1987, the University’s College of Music was named after him, the first such honor ever bestowed on a jazz musician. Lionel Hampton died on August 31, 2002 in New York City.